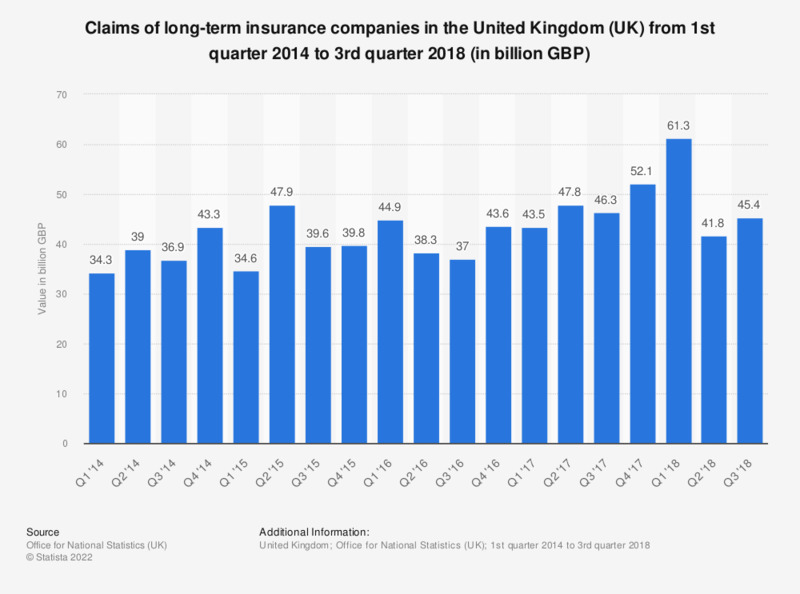 This statistic illustrates the quarterly claims of long-term insurance companies in the United Kingdom (UK) from the first quarter of 2014 to the third quarter of 2018. It can be seen that the total claims of long-term insurance companies fluctuated overall during the period under observation, reaching a value of 45.4 billion British pounds as of the third quarter of 2018. The largest value of claims was found in the first quarter of 2016, when premiums amounting to 61.3 billion British pounds were recorded. United Kingdom insurance brokers: how easy has it been to get a full settlement on claims over 2014 compared to 2013? Great Britain: Please select the amount you think represents the maximum amount of money per invididual that the Financial Services Compensation Scheme (FSCS) will protect? Great Britain: Have you heard of the Financial Services Compensation Scheme (FSCS)? United Kingdom brokers: Which factor has had the biggest negative impact on the claims experience over the past five years up to 2014?